The American Promise, Value Edition, has long been a course favorite. You’ll value the text’s readability, clear chronology, and lively voices of ordinary Americans, all in a portable format. The value edition includes the full narrative accompanied by a 2-color map program made available at an affordable price. LaunchPad combines carefully-curated assignments and assessments integrated with the full-length parent text e-book—the same narrative in the Value Edition but with full color art and maps and more features for analysis—in its own intuitive course space. 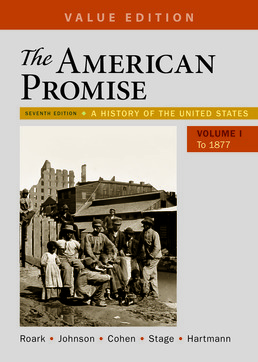 The American Promise, Value Edition with LaunchPad provides the best formats for every activity—the print book allows for a seamless reading experience while LaunchPad provides the right space for active learning assignments and dynamic course management tools that will measure and analyze your progress. LaunchPad comes with a wealth of primary sources and special critical thinking activities that will help you progress through the course, and LearningCurve is an adaptive learning tool you’ll love to use to cement your understanding of the text.